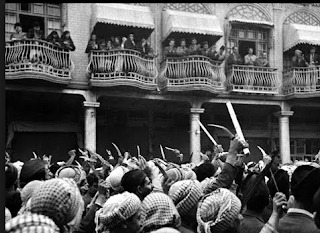 According to the Jerusalem Post, two Iraqi-Israeli petitioners suffered a setback when their demand for compensation for their suffering arising from the 1941 Farhud was rejected by the Israeli Supreme Court. The Court denied that the Farhud was the sole result of the direct impact of Nazism. One wonders whether the 2,000 survivors would be better off demanding Germany pay them reparations through the Claims Conference, as German radio did much to incite anti-Jewish hatred, and the Nazis supported the Palestinian Mufti and his pro-Nazi acolytes. Moroccan Jews have received compensation for wartime suffering, although they were only indirect victims of the Nazis. The High Court of Justice on Sunday rejected a petition submitted by Jews who were impacted by the 1941 Farhud Pogrom in Iraq that sought compensation from the State of Israel. The petitioners were asking to be compensated for their suffering and economic losses under a 1957 law designed for that purpose for Jewish victims of the Nazis. Two Iraqi-Israeli Jews demanded compensation under the 1957 law on behalf of around 2,000 Iraqi Jews. The state had denied their claims, saying the compensation law only applied to those directly impacted by the Nazis. The High Court expressed horror at the 179 Jews who were killed, and the thousands injured in the anti-Jewish pogrom in Iraq in 1941. It also agreed that the pogrom was partially caused by the antisemitic tone set by Germany and Iraqis aligned with the Germans. However, it said the 1957 law simply did not recognize them. Rather, the High Court endorsed the state’s narrow interpretation of who can be compensated under the 1957 law. The High Court implied that the Knesset could still compensate the Iraqi Jews for the 1941 pogrom, but that it would need to pass a new law. off topic// here is a not very good article about the Jewish migration to from Arab lands to Israel after 1948. The several mistakes in the article are typical of much writing on the subject, especially by non-Jews who come to the subject for ideological [mainly "leftist"] reasons.